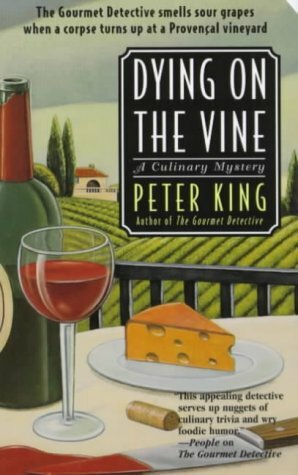 Investigating a shadowy business deal between two vineyards, the Gourmet Detective samples the delights of Provencal cuisine: Pate de Grives on triangles of hot, crisp toast -- or fresh local fish cooked in butter, meuniere style, covered with mushrooms. But thoughts of food vanish when the Gourmet Detective discovers the bloodstained corpse of a stranger draped over a cart in a vineyard. Could he really have been gored to death by sangliers, wild boars rumored to live in the abandoned caves surrounding the village? And what is the secret the local gendarme seems determined to hide? Provence is a land filled with suspicious people and myths that die hard. The Gourmet Detective finds himself in mortal danger when a villager standing next to him is killed by a crossbow and he himself is nearly drowned in a suspicious accident. "King spins another...mystery treat." -- "Publishers Weekly""Glorious menus...infused with a love of food and place, this third case sits just right on the palate and earns five stars." -- "Booknews""The appealing detective serves up nuggets of culinary trivia and wry foodie humor." -- "People "on "The Gourmet Detective"